Ed. Note: Congratulations to Ford Motor Company for being the maker of the best-selling police vehicle in the United States! 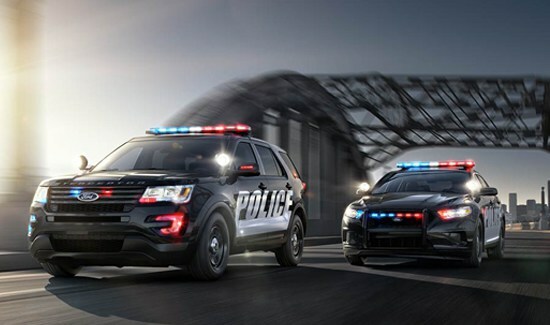 New figures from sales tracking firm IHS Market show that the SUV version of Ford’s Police Interceptor—a modified Explorer—just crossed the 50% market share threshold for the first time since it was introduced in 2012. Over the years, Ford has been a big supporter of American Police Beat, and it’s companies like this one that make it possible for us to bring you the best magazine in law enforcement every month. The best-selling police car in the U.S. now isn’t a car. It’s an SUV. While making up 51% of overall police vehicle sales through March, the Interceptor SUV has been an even bigger star within Ford’s vehicle lineup for law enforcement agencies — the SUV and a full-size sedan, which is based off the Taurus. “We projected that the Police Interceptor sedan was going to be roughly 75% of our mix. It flip flopped and the SUV is 75% of our mix,” said Stephen Tyler, Ford’s police brand marketing manager. In addition to the two models, Ford is also going to offer a hybrid police car — a modified Fusion sedan — to police departments. Getting police departments to think about SUVs, not cars, was, in retrospect, a bit of a gamble, Tyler said, when the decision was made to heavily promote the police version of the Explorer to departments. After having a lock on the police market for years with its Crown Victoria sedan, Ford’s sales fell when the gas-guzzling model was discontinued and rivals made a play for the police market with their full-size sedans. General Motors offered the police version of the Chevrolet Caprice and Fiat Chrysler had the Dodge Charger. The SUV didn’t get off to a hot start in the sale race. In 2012, only 12% of all new police cars sold by all brands were the Police Interceptor SUV, Ford says. Acceptance gradually grew as police agencies found that they liked the extra room that an SUV provided for all their gear and the higher seating position compared with sedans. With a turbocharged engine option, Ford billed the Interceptor SUV has having lots of power while being far more fuel efficient than the old Crown Vics. Plus, Ford officials told department that the Interceptor SUV was safe to use for high-speed pursuits even though SUVs often have a higher center of gravity. The Interceptor is heavily modified compared with the civilian version. It has upgraded suspension and cooling systems. It has special durable upholstery because of the heavy, around-the-clock use that its seats endure. There are even “anti-stab” plates embedded in the front seatbacks to keep people who have been arrested from trying to knife the officer who is transporting them to jail.